This is the exact same crap that thieves in fantasy RPGs have to do. Except if they fail, they are risking more then a broken light. This also changes my perspective on a thief's abilities. Given enough time, almost any trap or lock could probably be bypassed by a thief, but in most cases, they don't have much time. Therefore the relatively low success chances at low levels... They don't have the speed yet. So, yesterday afternoon I packed my bag real quick for a weekend in the Poconos. I like to pack light (because everyone else in the car tends to pack heavy), and i wanted to get some T&T solo gaming in this weekend so I grabbed the T&T 7.5e boxed set and some of the Corgi T&T books. I could have gone even lighter if I had left the 7.5e behind. I forgo that the Corgi books have a nearly complete T&T ruleset included in each one. They really are a great buy, especially if one wants to test out the system for cheap with a physical book. If you can't find them in a used bookstore, Flying Buffalo still as them cheap. Most are actually two solo adventures and the rules, so it's a great bargain. I used to do the Black Friday deal. You know the routine... up at 2am, wait on a line for something that you wouldn't be getting if it wasn't dirt cheap, just to find out that the only two pieces in inventory were sold to family members of the staff. Nope, these days my strategy is to do most of my shopping online. With the exception of hitting Walmart earlier this evening for a bunch of dirt cheap DVDs (and no lines), my Black Friday shopping was done online. More sleep, still buy stuff I wouldn't usually break down and buy, UPS Delivery Guy gets a decent Christmas tip. I'm very tempted by the Alienware 11" Screen Gaming Netbook for $599 - 1 gig of decent video ram, 2 gig of system ram,160 gb hd and an HDMI out has me drooling. Adding 3g ups the price and adds a monthly cost, but this Win 7 netbook can almost double as an iPad AND a desktop replacement. Maybe I can have a $699 version with 4 gb ram and a 250 gig hd added to my Christmas list. It's on sale until mid December. Many publishers are running sales at RPGNow. Chaosium is running a sale on their site. I think Troll Lord is too. If you were going to buy an iPad this Holiday Season, today is the day to pull the trigger on your purchase. To the best of my knowledge, this is the first time they have been put on sale (Marshals and TJ Max are selling some of the $499 iPads for $499 today, at limited stores in very limited quantities - trust me, they are all gone already). Should have a contest to announce this weekend. I need to confirm the generous prizes that Onebookshelf is supplying. I'll be hitting the usual suspects online over the next 24 hrs or so: Best Buy, Amazon, TigerDirect, Geeks... etc. A big thanks to Bat in the Attic for posting this. The Starter Boxed Set is the version of Traveller I started with, and for free the price can't be beat. It should be free until the end of the year. I meant to give this a mention on Tuesday, but time sometimes get's away from one. 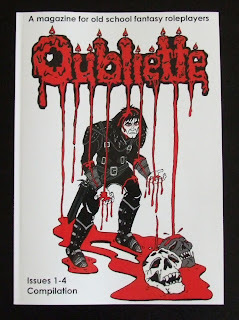 Oubliette is now available in print via Lulu. You can read all about it at the Oubliette Magazine blog, or just head to Lulu and order the 4 issue compilation. PDF copies of issues 1-4 are still available at RPGNow, and hopefully the next issue will be available in time for Christmas. Before I start the posts comparing some Solo Gaming Experiences, I'd like to address the question: "why play solo anyway?" I have no gaming group where I live. I GM all the time, I'd like to have a chance to play and no one else wants to GM. Sometimes I want to game when my group isn't available. I want to game more then my gaming group wants to. It's convenient and ready when I am. It's fun (it better be, or why do it). I'm sure there are dozens of reasons, but those are the basics as far as I am concerned. I remember running solo / GM-less dungeon crawls using the random dungeon generator and the wandering monster tables from the back of the AD&D Dungeon Master's Guide simply because I wanted to play. Games like Tunnels & Trolls address that desire to play a RPG when the individual player wants to by publishing solo adventures. Many of those early T&T solos weren't all that deep on story or plausibility, but they offered you an adventure that you could explore, face challenges, roll dice and if your were extremely lucky (or if you cheated) you didn't die. Solos tend to be fairly lethal, as you don't have a GM to soften the blow / make decisions on situations not covered by the rules / engage in role-play to avoid combat situations. That all being said, if you survive the adventure, you can increase in ability and use that same character in the next adventure. Therein lies the secret to the success of a good series of solo adventures - continuity of the PC. You didn't get that in an endless quest book. In my opinion, you need a simplified system to run solo adventures successfully. The more complicated the rules, the greater the need to have a GM arbitrate those rules. T&T works well as a solo system, as the rules can take a backseat to the character and story in a properly written solo. My instinct is that a system like 4e would only work as a solo if you greatly limited the options available to the player, and at that point i don't think you would be playing 4e anymore. I originally posted this in a thread on ENWorld earlier this week, but I'm reposting it here (edited slightly) as I think it has relevance - I am very interested in the VTTs that are, or soon will be, out there, and the Wizards' VTT could be a game changer when it's released, even if it is a buggy mess (not predicting - just saying). The WotC VTT is probably NOT aimed at you if you are currently playing in a face to face group. It's aimed at those that want to play with their old college group that is scattered across the country. More importantly, it is aimed at the lapsed players that bought the new Red Box and want to play with their old group which isn't a group anymore. Yes, there are other VTTs out there, but you would have to know about them to find them. WotC gets their VTT up and running, places a splash ad in the back of all it's books or each box, and people will suddenly KNOW about D&D's Virtual Table Top. The other stuff (4e Character & Monster Builders, etc) won't be bringing in a steady stream of NEW monthly fees, it will just give stuff to those that probably already subscribe. The VTT can bring in NEW subscribers. In all probability, if you are an ENWorld / RPG Blog-type regular, it's not aimed at you. If you made it here, and you want to game regularly, you either have a face to face group or you found one of the current VTTs that suits your needs. If you bought the Red Box, haven't gamed since 2e and your group is in the wind, then this VTT is squarely aimed at you. The integrated mailbox is a feature I've had on my iPhone for a bit... very happy to have it now on my iPad. The Air-Print feature, allowing one to print to a wireless printer I haven't tried yet. With any luck, I'll give it a try tonight. Finally I can group my apps into folders. I'm a pack rat app collector, and now I have even more room for my apps. Woot! Most importantly, my Apple Keyboard, specifically made for the iPad, wasn't always recognized by the old OS. I had to seat it and reseat it, sometimes within the same session. New OS? Seems flawless so far, but time will tell. I'm gonna run a solo tonight for myself... either some T&T or the LotFP Weird Fantasy Tutorial. Because if I don't get started and find the time now, time will just slip away during the Holiday Season without me even noticing. This is a short work week for me, yet time to read and / or game will be minimal during the non-working part, so the time to roll the dice is now. The OS 4.2 update is out for the iPad today. I'm installing as I type. I'll let you know what I think later. The holidays are sneaking up on us, and now is the time to find the deals to get your gift purchases for less (read cheaply). I spent 8 1/2 years working in a retail environment before becoming a public servant and I refuse to stand on those Black Friday lines - maybe if a game store was having a sale of that type, but even then probably not. Sodastream - make your own soda. It's about as geeky as you can get, and I am enjoying the crap out of it for the last month or so. I got mine at Bed, Bath & Beyond with one of their 15% off coupons. About $100 before coupons. Tablet Devices - the low end iPad will apparently be available for $399 at Marshalls and TJ-Max for Black Friday in very limited quantities. The iPad is no longer the only game in town, however. If your main desire is a mobile PDF reader, you can get Android Based 7" Resistive Touch Screen (means using pressure as opposed to the multi-touch iTouch/iPhone/iPad) for about $150 as a starting price. Ebook Readers - there's a whole bunch of them out now, with the Kindle starting at $139. Kindle has the advantage of the Amazon Kindle store, but adding books from outside the store can be a pain. Still, lots of choices out there and it's hard to go wrong. Amazon - yes, many folks consider it evil, but when I want my RPGs on the cheap its the place I hit. Less expensive and free shipping. RPGs - I'm a gamer, so I'll be happy to get a copy of a game I don't own, or even one I do. Still, as its a gift purchase. I recommend something that comes in a box. It's just more exciting when you unwrap and get a box then a book, probably because you know its a book the moment you feel it through the wrapping paper. We're doing pretty well with the Old School module releases recently, at least if you are looking for low level adventures. Path of the Delver from Knightvision Games is the latest OSR release on RPGNow. At quick glance, it has some highs and some lows, but that's to be expected for the first release from a new publisher. First, the lows: The map of the town of Castle Wickersham is pretty useless. It is muddied and unkeyed except for the scale. The outdoor map actually looks pretty useful, but again lacks a map key AND a scale in this case. The dungeon maps look pretty well done, but again, they lack a scale (is it 5' or 10' on the grid? - 5' judging by the description of cavern room 18). On the plus side, there are some player handouts, a new Cleric Spell, 9 new magic items and a dozen new monsters. The whole thing, including the OGL, clocks in at 48 pages. Sundays have become a day of relaxation for me recently. No work, no shopping, no drama... just me, some reading, possibly some game playing and football. All because the kid was really determined to have a day that was just for himself and I... which really means he plays computer games and I watch football.